Those who haven't completed the 26 miles, 385 yards - or gave their best in the effort - don't realize the sacrifice required to prepare and finish a marathon! All those lonely miles on the road are honored in the smartly designed running shoes marathon personalized Christmas ornament that arrives in our velvet drawstring pouch. 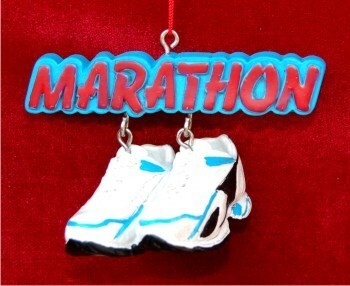 We customize these sports ornaments personalized as symbols of pride for serious runners. Remember the hard work and celebrate the personal achievements obtained in the effort with the stylish and bright marathon shoes ornament personalized as a gift for a special runner on your list. For girlfriend Dec 15, 2014 Chad K.